I recently attended the CAAUK 2016 meeting in Leicester, a great couple of days with a few really interesting papers. As usual, the rather excellent Dougs Rocks-Macqueen was on hand to record the talks. His videos can be found here – he records all sorts of diverse archaeological conferences, so it is well worth clicking the subscribe button on his account. In case anyone is interested, I have embedded the video of my talk below – where I discuss the Embodied GIS, using examples from my previous research including Voices Recognition and the Dead Man’s Nose. I have had quite few requests for a continuation of my how-to series, for getting GIS data into an augmented reality environment and for creating an embodied GIS. I promise I will get back to the how-tos very soon, but first I wanted to share something else that I have been experimenting with. The Dead Man’s Nose (DMN) is a very early prototype of a smell delivery device that wafts certain smells gently into your nose based on your location. The hardware is built using an Arduino microcontroller and some cheap computer parts along with any scent of your choice. The software is a very simple webserver that can be accessed via WiFi and ‘fire off’ smells via the webserver’s querystring. This means that it can easily be fired by Unity3D (or any other software that can access a webpage) – so it fits very nicely into my embodied GIS setup. This little ‘maker hack’ takes it inspiration from projects such as ‘My TV Stinks‘, ‘The Smell of Success‘ and Mint Foundry’s ‘Olly‘. Essentially, I followed the instructions for building an Olly (without the 3D housing) and instead of using an Ethernet shield for the Arduino – I connected it to a WiFi shield and from there joined it to an ad-hoc WiFi network created by my Macbook. With the Macbook, iPad and the DMN on the same network it is very easy to send a message to the DMN from within the Unity gaming engine. As the iPad running the Unity application knows where I am in the world (see the previous blog) it means that I can fire off smells according to coordinates (or areas) defined in a GIS layer. Therefore, if I have an accurate ‘smellscape’ modeled in GIS, I can deploy that smellscape into the real world and augment the smells in the same way that I can augment the visual elements of the GIS data. The code is very simple for both ends, I am just using the a slightly adjusted sample WiFi shield code on the Arduino end and a small script on the Unity end that pings the webserver when the ‘player’ moves into a certain place on the landscape. 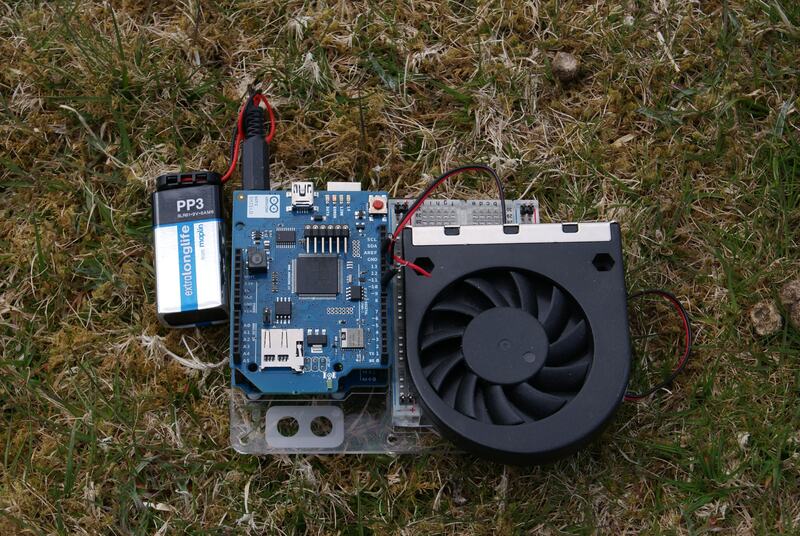 When the webserver is pinged, it starts the fan and that wafts the smell around. From a relatively simple setup, it provides the possibility of a very rich experience when using the embodied GIS. The first thing to do was to find the smells to actually augment using the Dead Man’s Nose. It turns out there are a lot of different places to buy scents, but luckily in this case archaeologists came to the rescue – an article in the excellent Summer 2012 edition of Love Archaeology e-zine pointed me to the website of Dale Air who have over 300 aromas ranging from the mundane (Crusty Bread) to the completely weird (Dragon’s Breath). I purchased a set of samples (Barbeque, Dirty Linen, Woodsmoke, Farmyard, among others) and was ready to go. I was quite surprised, but they do actually smell pretty much as described, especially the Dirty Linen. 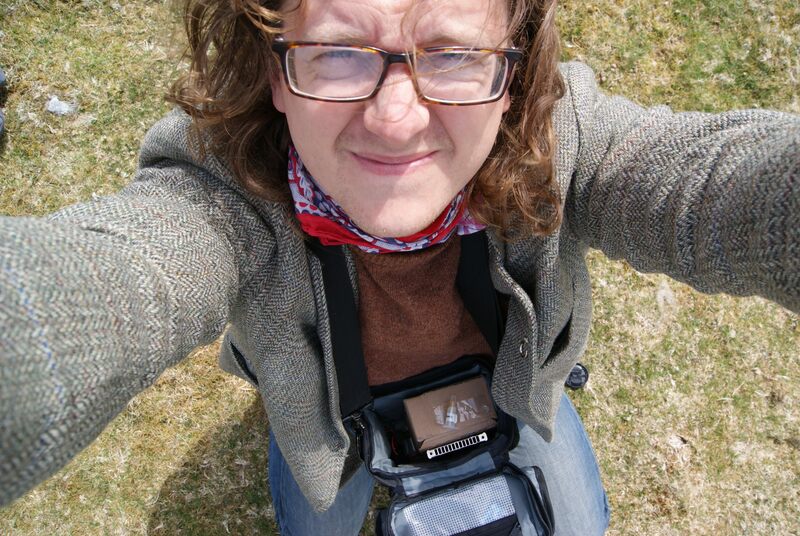 The prototype was then loaded into a bag (in this case a simple camera bag), which was slung around my neck. I popped the top of the BBQ scent open and then whenever the fan started whirring the sweet, slightly acrid smell of Barbequing meat was gently wafted to my nostrils. 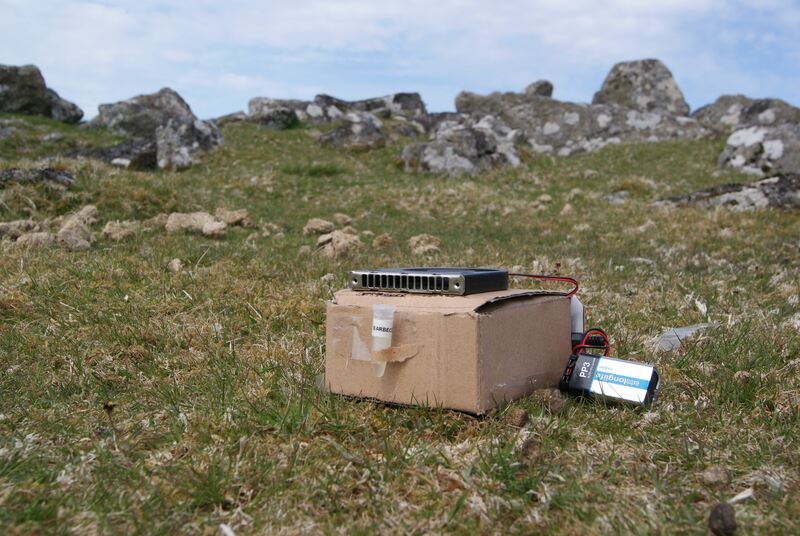 Using my embodied GIS of the roundhouses on Leskernick Hill, Bodmin Moor, I set the DMN to fire off a smell of lovely Barbeque whenever I got within 20m of a roundhouse. I set the fan to run slowly at first and get faster as I got closer to the ‘source’ of the smell. The DMN performed admirably, as I walked within range of the houses I heard the tell-tale whirr of the fan and the next moment I had the lovely scent of cooking ribs. Future models will allow for more than one smell at a time (I just need a couple more computer fans) and also a better housing, a bit of 3D printing is in order! Now I can use the iPad to view the roundhouses overlaid onto the video feed, plug in my headphones and hear 3D sounds that get louder or quieter depending on where I am in the settlement and also I can augment different smells as I walk around. Not only can I walk around the modern day Bronze Age landscape and see the augmented roundhouses, hear the Bronze Age sheep in the distance, I can also smell the fires burning and the dinner cooking as I get closer to the village…. If there is interest I can put together a how-to for creating the system, but for now I am going to carry on experimenting with it – to refine the delivery and the housing and to clean up the code a little bit.